It’s my favorite time of year! Cherry season! My favorite cherries are Ranier cherries. Those yellow-red cherries are just so delicious. I just buy pounds and pounds during the summer. And they’re great just washed and rapidly eaten on their own. But what if I put it in a drink? I remembered a great cherry daiquiri I had a few years ago at 1886 in Pasadena and decided to recreate it. Gently muddle the cherries in your shaker. Add the rum, lime and simple with ice and shake. Strain into a cocktail glass. I normally would double-strain but since I want all those cherry bits, I left them in. 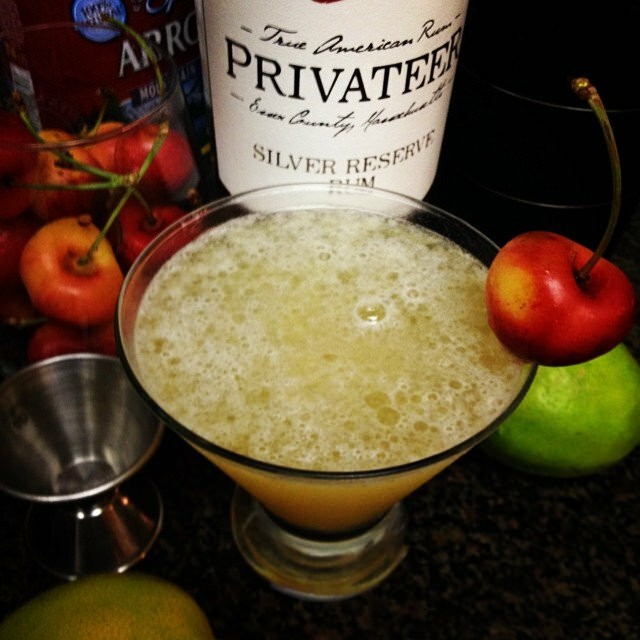 Garnish with a cherry, preferably with a stem for that artsy look. This entry was posted in alcohol education, alcohol tasting, bar stories, cocktails, history, la, la cocktails, los angeles, spirits, the minty and tagged cherries, cherry, daiquiri, drinkwire, la cocktails, privateer rum, rainier cherries, rum, the minty. Bookmark the permalink.